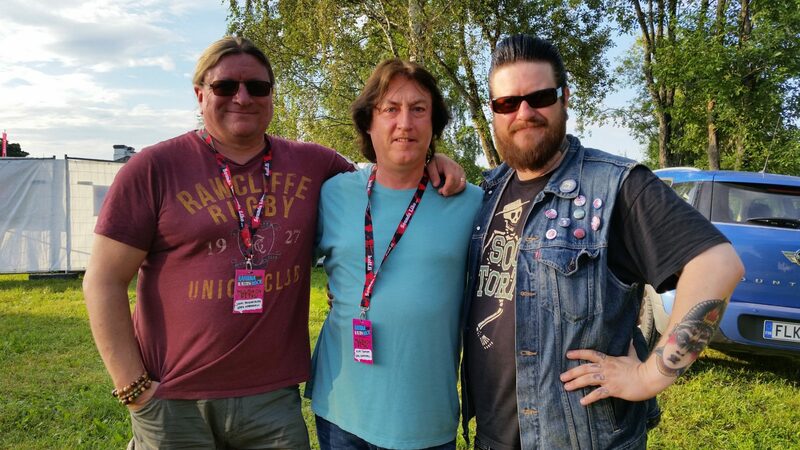 On the Road at the moment somewhere…….Left to Right Sami Ruusukallio, me , Ville Makinen. Hope that you manage to catch some of the Martin Barre Dates in addition to the John Jorgenson GIGs. 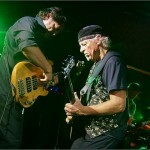 Hope to see you all soon, I know that we should be in Kinross in the Autumn with Martin Barre. See you all then! Looking forward to another show with Elliott Morris and myself as Well Kept Secret. We will be playing Elliott’s solo songs as well as a few John Martyn Songs thrown in. Friday 6th March at Backstage at the Green Hotel, I hope some of you may be able to come along and support the show! Tickets can be bought HERE. Bumped into Pino Palladino on the flight home yesterday! Saw him playing in Glasgow with the Who . Great show and playing as always! 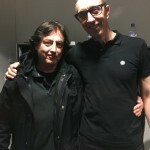 Session ace Pino Palladino broke through playing fretless bass on Gary Numan’s I, Assassin in 1982 and quickly went on to play with the likes of David Gilmour, Peter Gabriel and Phil Collins. 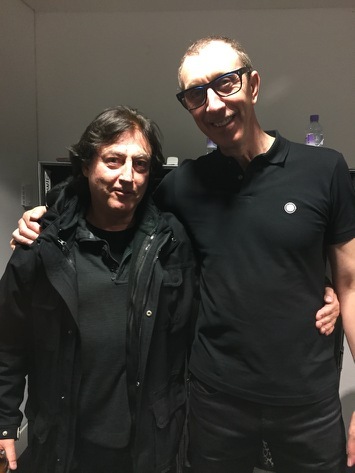 In the last decade, he’s spent his time filling the considerably large shoes of John Entwistle in The Who and also cropped up on Adele’s planet-dominating album 21. 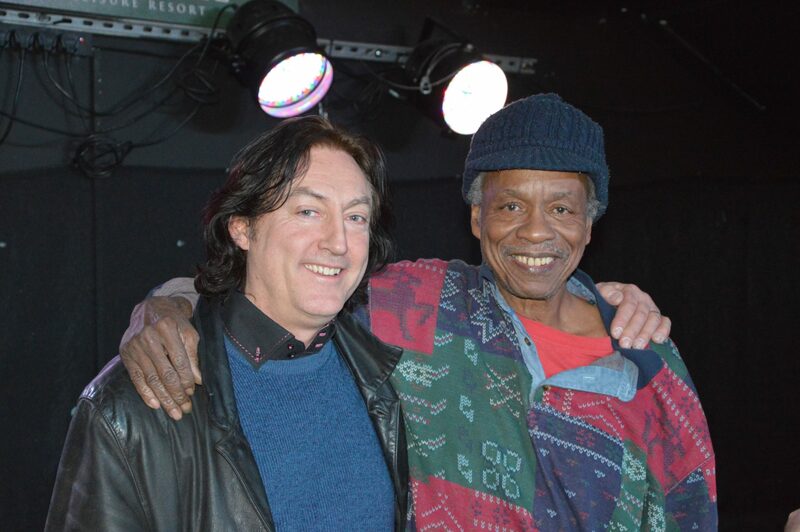 Photo shows Pino with myself, Alan Thomson. 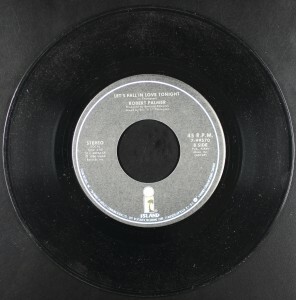 Fuzz and Conrad were then hired to record Stephen Stills’ first solo album which included superstars Jimi Hendrix, Eric Clapton, Mama Cass, Rita Coolidge, Ringo Starr, Billy Preston and The Memphis Horns. During this time he worked with P.P. Arnold performing under the name Axis. 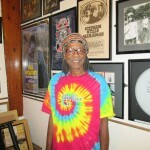 A big break came getting him a position with Crosby, Stills, Nash & Young. Working sessions between London and Los Angeles, he became part of Manassas, with Stephen Stills, Chris Hillman, Dallas Taylor, Joe Lala, Paul Harris and Al Perkins, cutting two albums and touring for three years while finding time to do concerts with the band America. Wrote and recorded songs with Marianne Faithful along with Steve Winwood in the early 1980s. Later he joined the Alvin Lee Band along with Mick Taylor and Tom Compton. 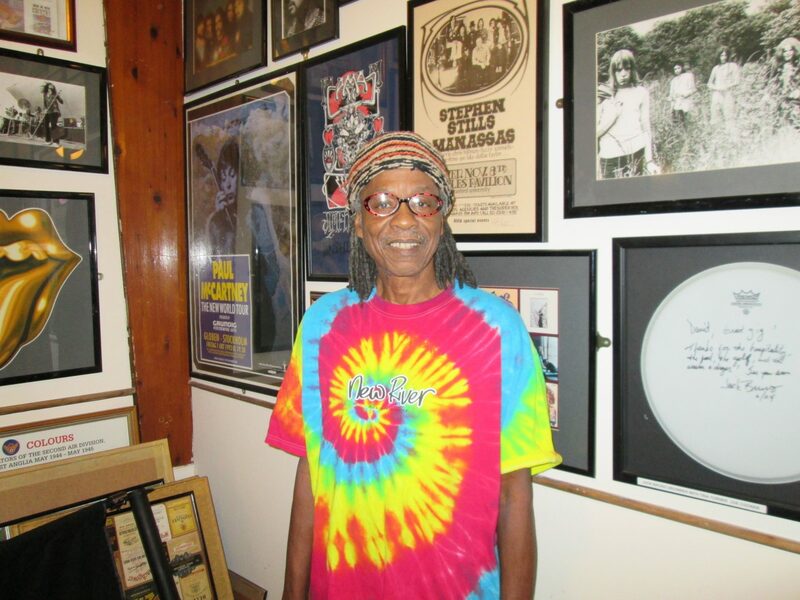 For Taj Mahal, he worked on the Broadway musical, Mule Bone written by Langston Hughes and Zora Lee Hurston, with music composed by Taj starring blues man Kenny Neal. In the early 1990s he teamed up with Bobby keys, Mick Taylor, Nicky Hopkins and Ivan Neville as Tumbling Dice. Now he is performing as a solo artist on Bouzouki, Various Guitars and Vocals a World Beat blend of Blues, Reggae, Calypso, Classic Rock and Folk songs. 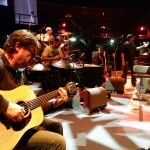 He played a wonderful show for Mundell Music with Nils-Ole Poulin. Here are a couple of photos. 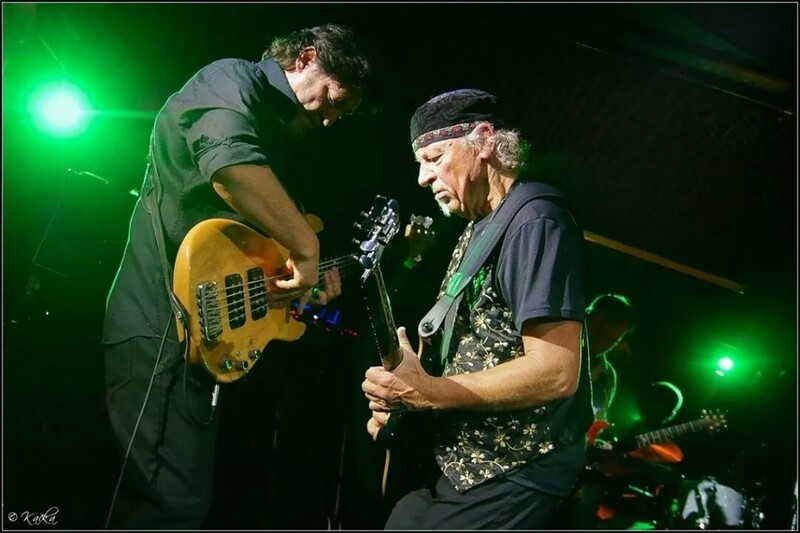 On Tour with the Martin Barre Band in Prague. In fact I think it was the Retro Club. Fantastic Photos from Kate. 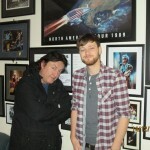 I like the Photo with Martin & myself (Alan Thomson). Hope some of you have managed to catch one or two of the shows. 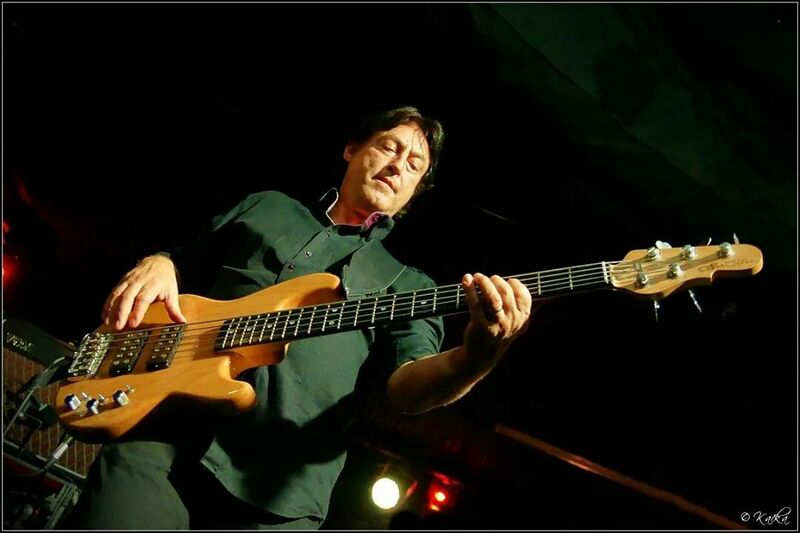 Check my site for Tour dates HERE. That was a great series of GIGs Alan Thomson with The Webb Sisters and John Jorgenson. We played Kinross, Troon and Ullapool to name but a few. I managed to fit these shows inbetween the Martin Barre Tour! Here are a couple of shots from the Green Hotel GIG with Mundell Music in Kinross. Who was at the show? 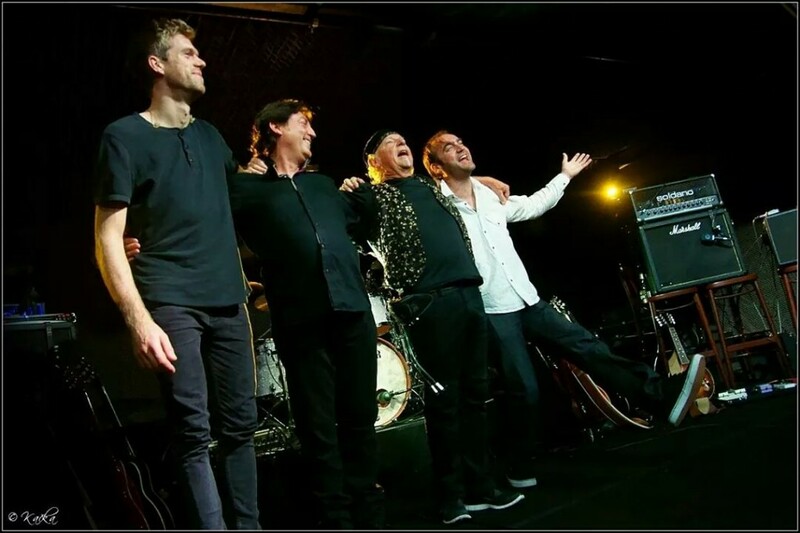 There has been some fantastic feedback from that Tour and lets hope we can all do it again sometime. I loved the version of Abba‘s S.O.S.!! 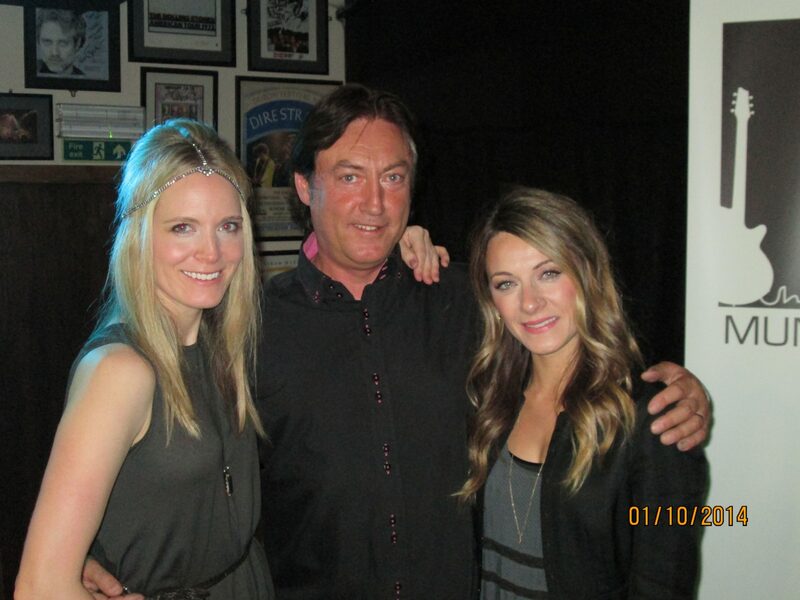 Alan Thomson & The Webb Sisters! Here’s a Robert Palmer Video. Let’s Fall In Love Tonight.It was the B Side of the Addicted To Love Single and YES I, Alan Thomson Wrote It! It Was Going To Be On the ‘Riptide’ Album But Got Bumped At Last Minuit! Typical!!! Here’s a great photo from a couple of weeks ago. 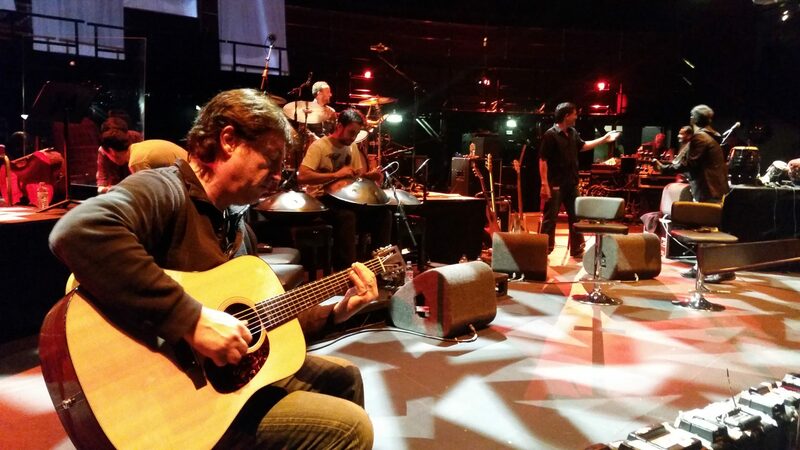 This was when I was playing for Nitin Sawhney. Just going on Tour now with the Webb Sisters and John Jorgenson for a few selected dates, Kinross, Troon and Ullapool to mention but three. I will try and let you all see some photos taken on the road when I get the opportunity to post them!! 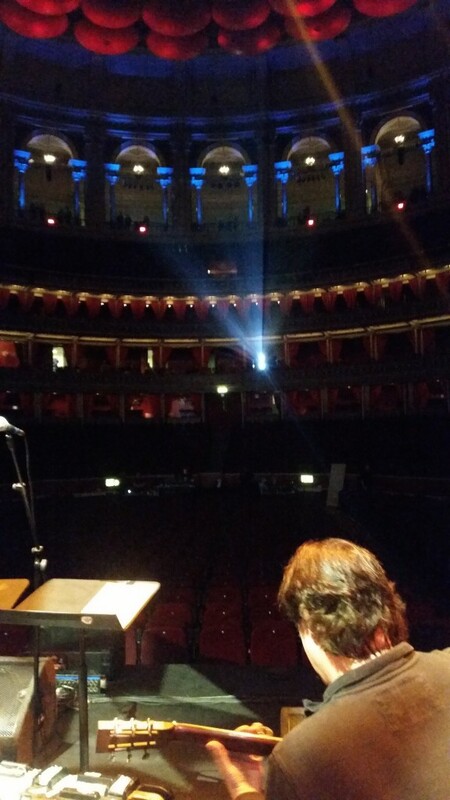 Alan Thomson at the Royal Albert Hall with Nitin Sawhney on Sunday 21st September. 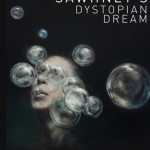 Nitin Sawhney, one of the most distinctive and versatile musical voices alive today, returns to the Royal Albert Hall to perform work from his forthcoming album Dystopian Dream and a selection of material from his first nine albums. Firmly established as a world-class producer, songwriter, DJ, multi-instrumentalist, orchestral composer and cultural pioneer, Sawhney has become a latter-day Renaissance man in the worlds of music, film, video games, dance and theatre. This concert will see Sawhney and guests showcase the highlights of his celebrated career and follows the release of OneZero, a live performance cut straight to vinyl, which featured reworked material from across his distinguished back catalogue. 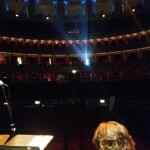 Looking forward to the GIG on Sunday 21st September With Nitin Sawhney at the Royal Albert Hall no less! The forthcoming album, Dystopian Dream, sees Nitin returning to the darker, emotive sounds of his earlier albums, where he cultivated a unique identity that transcended London’s fickle music scene. As a producer and polymath steeped in Eastern and Western classical music, flamenco, trip-hop, drum n bass and dubstep, Sawhney has continued to innovate, experiment and defy convention across the world. 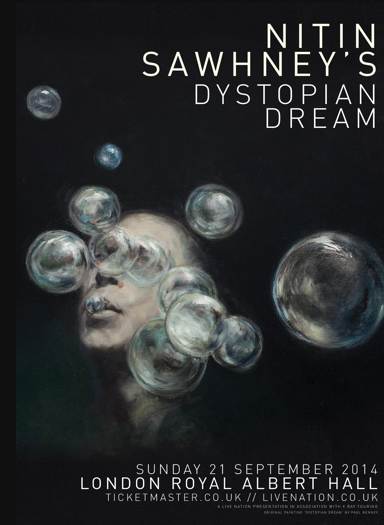 Watching the lame political response to riots and unrest from London to New York amidst brewing tensions the world over, Sawhney has responded from an intimate yet epic place with a powerful and sonorous melting pot of thoughts, feelings and personal catharsis. Dystopian Dream is the elusive light at the end of an infinite tunnel.